The progress of the Indian Coconut Sector during the last two decades can be classified into three distinct categories. First is the progress achieved in extending the cultivation of the crop in more areas both in traditional and non-traditional areas. Second is the increase in area, production and productivity of coconut in the country with the regress in the consumption of coconut oil in both edible and non-edible sector which warranted the need for the development of broad based processing technologies for the sustainable growth of the industry. Third is the problems of low income from the coconut holdings due to price fluctuations, decline in the prices of coconut and its products which necessitated the need for the development of appropriate coconut based farming systems to enhance the farm level income. The stiff import duties imposed on the edible oils and restricted import of the coconut products played an important role in keeping the domestic price high. Hence the structural rigidities in the coconut industry have been keeping a hold on its performance. The industry has not able to unleash its true potential mainly because of its oil driven market. However by realizing the imperative need to become competitive, the industry is now undergoing modernization, product diversification and byproduct utilization and restructuring process. Consumer demands for varied high value coconut products are tremendously increasing and hence the domestic industries have become vibrant. This in turn would help make the industry globally competitive. Consequent to the liberalization of the Indian economy, the domestic industry has not been catching up commensurating with the growth of other world leaders like Philippines, Indonesia, Thailand and Sri Lanka. 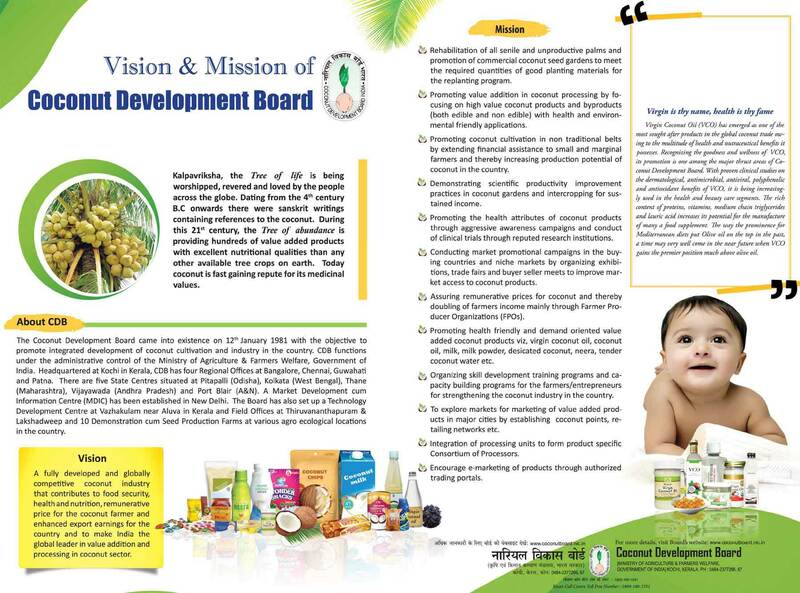 However, new vistas could be opened up in value addition and products development due to the timely interventions and concerted efforts of the organizations like Coconut Development Board, Central Plantation Crops Research Institute, Central Food Technological Research Institute, Defence Food Research Laboratory, Regional Research Laboratory, SAUs etc. by development and infusion of appropriate technologies which have resulted in value addition in coconut and emergence of variety of products in edible and non-edible sector. The economic globalization has made possible the integration of various regional markets into a world market encompassing the entire globe within its sphere. New coconut products from elsewhere in the world have been found prominent place in the product profiles of the food chain markets in the country. In pursuit of making the Indian coconut products accessible to consumers across the world, there have been significant changes in the domestic markets in terms of product developments and deep market integration. Viable processing technologies are now indigenously available in the country for manufacture of varied products based on coconut kernel, coconut water, husk, shell and coconut stem. The potential of coconut palm as a source of renewable energy is also being recognized. The emphasis given by the Coconut Development Board on evolving technologies for the development of new value added products has yielded results and the product diversification and byproduct utilization has gained momentum in the recent past. Various research programmes sponsored by the Board through the premier research institutions in the country led to the development of new technologies for the manufacture of coconut cream, spray dried coconut milk powder, preserved and packed tender water and coconut water based vinegar. The commercialization of these technologies has gained momentum consequent to the launching of Technology Mission on Coconut in 2001. Many processing units have been established in different parts of the country for the commercial production of products with the technologies so developed. Accelerated efforts of market promotion and product awareness have fuelled the pace of commercialization. Now the coconut economy of India is in a convenient status. India accounts for 22.34 per cent of the world’s coconut production and is one of the major players in the world’s coconut trade. Currently the crop is grown in 1.91 million ha with an annual production of nearly 13000 million nuts. Copra processing, coconut oil extraction and coir manufacturing are the traditional coconut based industries in the country. The price of the coconut in the country is dependent on the prevailing price of coconut oil which is characterized by recurring violent fluctuations. The behavior of coconut oil price is relatively dependent on overall supply of oils and fats in the country. The fluctuation in the price of the coconut oil simultaneously reflects on the price of coconut. The volatile price situation often ends in the negligence of the coconut gardens, leading to attack of pests and diseases and low productivity. Of the range of ways, promoting cost effective coconut based farming system, product diversification and value addition play a crucial role in the stabilization of the coconut oil driven domestic market and is essential for reorienting and engineering the Indian Coconut Industry cost effective and globally competitive. The Coconut Development Board has been playing pivotal role in promoting viable coconut based farming system, on-farm processing and products development. The production and marketing of value added products have started attracting commercial interest and the situation brought rejuvenation in the sector. Price for coconut products has been on an upward trend. The market promotional measures undertaken in pursuit of the popularization of health benefits of coconut oil and tender coconut water have attributed a stimulating effect on the less dependency of coconut oil driven coconut economy. The concerted efforts of the Board in enhancing farm level income through productivity improvement and other production measures, product diversification and subsequent demand creations for the new products have resulted in a dynamic push to the industry for its sustained growth (Thomas Mathew, 2004). Thus the Board has, by now rendered yeomen service to the cause of the coconut industry. There has been a well defined network in the country to undertake the R&D of coconut. The State Agricultural Universities, ICAR Institutes, Agriculture/ Horticulture Departments of States/ UTs, organizations like, NAFED, Kerafed, Marketfed, etc. and private institutions contribute to the pursuit of the research and development process of coconut in the country.